After the Parliamentarians under Colonel General Ashton broke the siege of Cockermouth Castle in September 1648, the Royalist cavalry regrouped at Appleby Castle—with Sir Thomas Tyldesley 1612-1651 amongst their number. 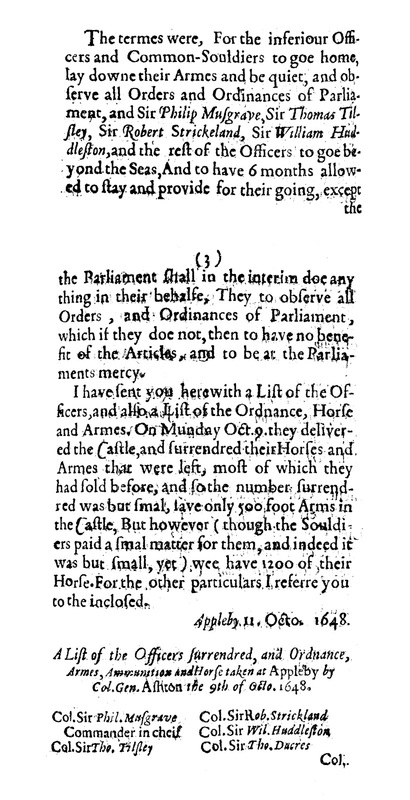 The termes were, For the inferiour Officers and Common-Souldiers to goe home, lay downe their Armes and be quiet, and observe all Orders and Ordinances of Parliament, and Sir Philip Musgrave, Sir Thomas Tilsley, Sir Robert Strickeland, Sir William Huddleston, and the rest of the Officers to goe beyond the Seas, And to have 6 months allowed to stay and provide for their going, except the Parliament shall in the interim doe any thing in their behalfe, They to observe all Orders, and Ordinances of Parliament, which if they doe not, then to have no benefit of the Articles, and to be at the Parliaments mercy. I have sent you herewith a List of the Officers, and also a List of the Ordnance, Horse and Armes. On Munday Oct. 9. they delivered the Castle, and surrendred their Horses and Armes that were left, most of which they had sold before, and so the number surrendred was but smal, save only 500 foot Arms in the Castle, But however (though the Souldiers paid a smal matter for them, and indeed it was but small, yet) wee have 1200 of their Horse. For the other particulars I referre you to the inclosed. A List of the Officers surrendred, and Ordnance, Armes, Ammunition and Horse taken at Appleby by Col. Gen. Ashton the 9th of Octo. 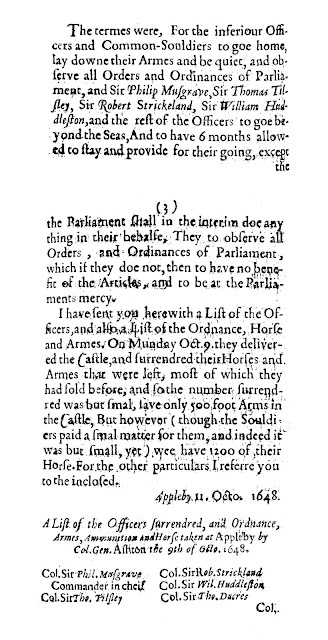 1648. 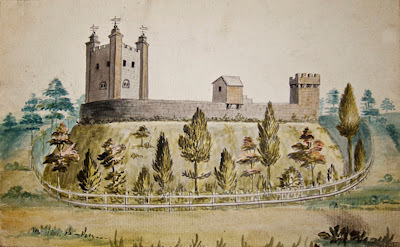 Clarendon records that after the murder of Charles I on 30 January 1649, Sir Thomas Tyldesley did indeed "goe beyond the seas", travelling to Ireland to join the Marquis of Ormond. This is no doubt the source for similar comments in the Dictionary of National Biography. 1. A great victory at Applebey, Col. General Ashton, 9 October 1648.